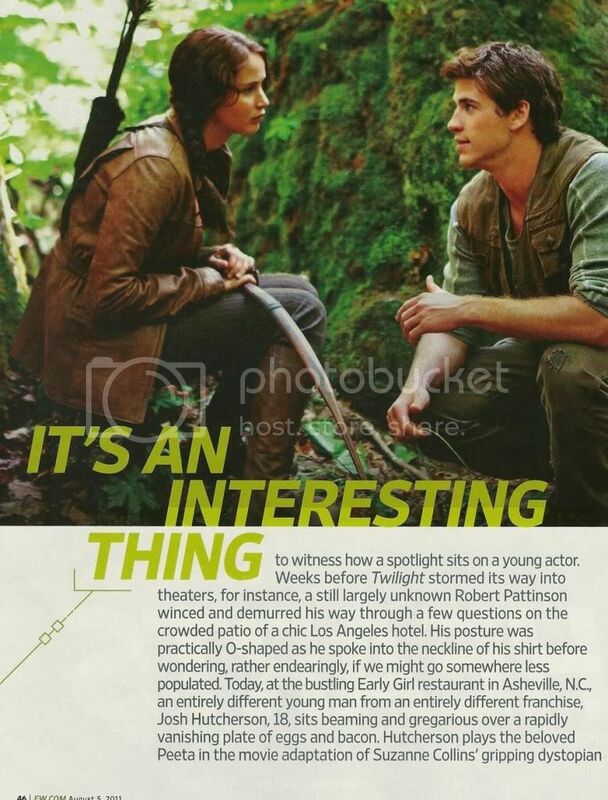 Sweet Rob was mentioned at the beginning of Entertainment Weekly's 'Men of Hunger Games' article (August 5, 2011). "Its an interesting thing to witness how a spotlight sits on a young actor. Weeks before Twilight stormed its way into theaters, for instance, a still largely unknown Robert Pattinson winced and demurred his way through a few questions on a crowded patio of a chic Los Angeles hotel. His posture was practically O-shaped as he spoke into the neckline of his shirt before wondering, rather endearingly, if we might go somewhere less populated. Today, at the bustling Early Girl restaurant in Asheville, NC an entirely different young man from an entirely different franchise, Josh Hutcherson, 18, sits beaming and gregarious over a rapidly vanishing plate of eggs and bacon. Hutcherson plays the beloved Peeta in the movie adaptation of Suzanna Collins' gripping trilogy, 'The Hunger Games." This is such a sweet Rob-mention that I can't bypass. Hey, no need to hate on JoshHutch, they're just different individuals that's all.